As I explained in my previous post, I have yet to inspire a single person outside of this blog to try the Potato Hack diet. Not even for a single day. Not even for a single meal. The people that understand why the hack works can not fathom missing the taste of delicious food for a few days or even a few hours. People like us that think about health and read health blogs sometimes can be inspired, but the average person? Nope. The story is too hard for them. They don’t believe they can do it. Last week I wondered if the Potato Hack could be made easier in a way that inspired more participants and was still effective. This is version 1 of that idea. This version of the Potato Hack simply states you must eat a single boiled potato prior to every meal and then wait 20 minutes before eating anything else. Just like the Potato Hack, you will be eating the potato plain. Nothing more than salt. What I am describing here is a Hack of the Hack. There should be far fewer objections to those people fearful of eating just potatoes. If you are still very hungry, you can have more potatoes, but the rest of your meal must come 20 minutes later. Unlike the classic Potato Hack, which can yield massive results quickly, this version will be slow and steady. It will also be the training wheels for those that can’t imagine going a full meal or full day or more eating just boiled potatoes. It is building a powerful habit. Potatoes reduce hunger levels more than any other food on the planet. Waiting 20 minutes after eating lowers ghrelin levels, which is the hormone that triggers hunger. 20 minutes is enough time to prepare a meal. This pause is to prevent eating too much too quickly. See Stomach hormone ghrelin increases desire for high-calorie foods, study finds. All the resistant starch benefits described in Potato Hack: Weight Loss Simplified (Amazon USA, Amazon UK, Amazon CANADA). It is super easy and cheap to prepare potatoes the day before. Anyone can boil potatoes and place them in the refrigerator overnight. A medium potato has about 161 calories and a large potato has 278. Not a lot, but because plain boiled potatoes are so filling, it feels like you’ve consumed twice as many calories. And there in lies the magic. I strongly believe in the power of story. Stories are simple narratives to guide us in decision making. I talk about this concept in the post Using the Power of Story For Fat Loss. Stories are often more persuasive than facts and good stories will have a visual component. Marine Potato 20 is a simple story that hides the details that I listed above. In war, the Marines are the first to show up. They storm the beach or the town and push the enemy back enough so that the army can arrive later and take fewer casualties. Here the war is your battle with weighing too much. Too much hunger is your enemy. The Marines are very good at what they do. So is the Potato. Marine Potato 20 is about eating a single potato at the start of as many meals as possible. It will take the Marine Potato about 20 minutes to weaken the enemy. With the enemy weakened, the Army will need fewer troops (calories) to defeat the enemy (hunger). When I mentioned the single potato idea to a friend, she responded that is why salads before meals work and she would rather eat a salad. She is correct. But the salad story is boring. It doesn’t capture the attention of the public. The thought of buying a bunch of veggies, cleaning them, cutting them, and assembling a salad is a non-starter for most busy people. Potatoes keep much longer, are cheaper, and require far less prep work. Plus Marine Potato is a badass. Much tougher than Susie Salad. Yes. It works. During my recent 22-pound weight loss, I have been doing a version of Marine Potato 20. Whenever I would get a strong craving for a high-calorie food, I had a rule in place. I could eat whatever I wanted, but first, I had to have a serving of plain boiled potatoes. What happened every time was 20 minutes after eating the potatoes I no longer craved the high-calorie meal and I instead chose something more healthy. I did this trick SO MANY times in the past few months. It absolutely works. The only thing required is that I have cooked potatoes ready to eat at all times. And I do. The 150-200 calories of boiled potatoes not only displaced those calories later in the meal, but they prevented me from making poor decisions before my brain registered that I was no longer hungry. Boil potatoes in advance and store them in the refrigerator. 1-3 days is a good place to start. Medium sized potatoes are fine. If you don’t want to peel, get some organic potatoes. If you are a big boy and have a lot of weight to lose, double up. 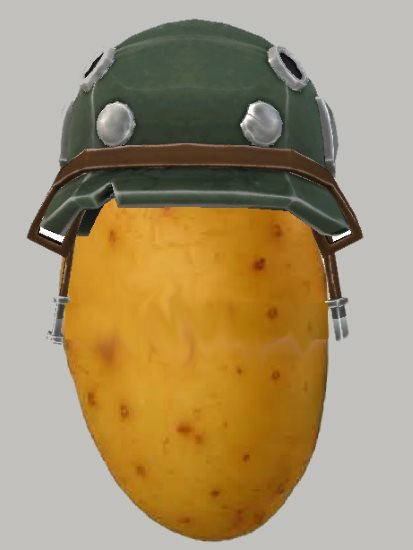 Every Marine Potato you deploy to the battle will reduce your hunger further. At the start of each meal, eat one potato (or 2) and then wait 20 minutes before eating whatever else you had planned. Keep this up and soon you’ll get the upper hand on hunger. You’ll experience many battlefield victories. You’ll drop weight. Then you’ll get it and perhaps you’ll extend your enlistment and join the rest of us for the longer multi-day Potato Hack missions. Make it happen, soldier! great idea! I’m going to try this for a few days as I have potatoes in the house I need to use. as far as story lines go, I’m guessing the stories of self-discipline and self-control that seem to inspire you aren’t inspiring at all to a lot of people. (for example the “closer” video you posted only served to remind me why I left corporate America and hope never to return!) but to each their own (inspirational story). @Tim – Thanks. I had read about the study. Very interesting. @Norlee – Excellent point. We all need to find the narratives that inspire us. This is an idea that sounds very interesting. I would think people who don’t want to abandon all food for just three days, save potatoes, would like this. It reminds me of the VB6 idea that Mark Bittman wrote about. I don’t want to be a vegetarian/vegan either, but I also want a better ordered gut and better numbers overall. It is also an idea that my sister, a notoriously picky eater, would use when she was going out to eat and was afraid of not finding anything she liked! I thought the book you recommended in another post was responsible for your weight loss. When I posted about this on Tim’s site, he suggested I vary the textures — maybe boiled during the day, baked at night, mashed another time. I think I did those hacks in the fall, so your recent post about summertime hacking will be worth trying. I should also try it with just salt; I used tobasco for a couple of batches and the flavoring probably worked against me. BTW, I’m 6’3″, about 210lbs, and need to lose a couple inches of abdominal fat. I don’t have a ‘story’ around losing my fat or even getting in shape generally, they’re just disconnected interventions and dosages of various types — food, exercise, etc. — or experiments (like the potato hack) that I introduce into my life from out of nowhere. Perhaps I would profit more from thinking of ways to draw these strands together into my own unified ‘hero’ story. @Cathy – The book “The Power of When” was helpful to me and probably helped a little, but it was not a major factor in my weight loss. @Mike – Perhaps try the VB6 idea Cathy mentioned. Instead of Vegan Before 6 PM, Potatoes before 6 PM. That way you lock if you deficit before evening and then have a normal dinner. Most days of the year I am not doing the full Potato Hack, but I am swapping a meal here and there. Usually, one and sometimes two meals a day are nothing but cold boiled potatoes with a pinch of salt. Salads are so easy nowadays. They come ready-washed in baggies and you can buy any dressing you want. With potatoes, you’ve got to wash, cook and then cool them. That’s actually more work than a bagged salad.